Cassie: I love this Mother’s Day card, Charlie. 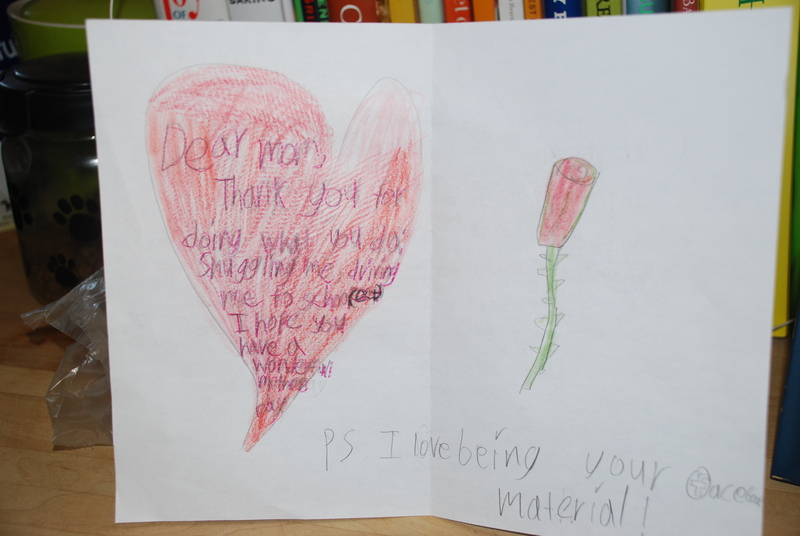 Cassie: I especially love the part about how you like providing material for my writing. Charlie: I got some coaching on that. But what I said about snuggling….that was all me. Cassie: Oh. So you don’t really like that I write about you all the time on face book and my blog? Charlie: It’s okay, I guess. But, it’s not my top thing. Cassie: You’re my muse. You’re one of my inspirations, along with the other kids. But, you know, I DO seem to write about YOU the most. Cassie: Yes. You know you are. Charlie: If you’re famous some day, then it will all be because of me. Cassie: I don’t think I’m going to be famous. But, I’m pretty certain YOU will be. Charlie: Happy Mother’s Day, Mom. You can give me one kiss on each cheek. But please don’t do it so hard that you make my ears ring. Cassie: Okay, Charlie. Love you.